The interior of the Church is simple with plain glass windows in keeping with the intentions of the architect. 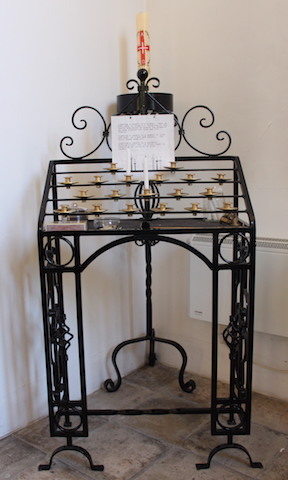 The candle stand was made and donated by Ian Benson. It is situated at the front right of the church and anyone is welcome to light a candle for someone special to them. a series of images depicting Jesus Christ on the day of his crucifixion and accompanying prayers. The stations grew out of imitations of Via Dolorosa in Jerusalem which is believed to be the actual path Jesus walked to Mount Calvary. The object of the stations is to help the Christian faithful to make a spiritual pilgrimage through contemplation of the Passion of Christ. These are simple representations in line with the architecture of the church and leaflets are available at the back of church to explain their significance. They were designed and made by Church Members, Miriam and Bill Longstaff.